Justice came too late for another fallen OC rider on Thursday. Forty-four year old Daniella Palacios was riding in Anaheim last November when she was hit by a truck driven by Junior Rigoberto Lopez. Lopez fled the scene, leaving the mother of eight to die in an Orange County Hospital. He tried to hide the damage by fleeing to Mexico, where he had the truck repaired before returning to the US six weeks later. It didn’t work; he was arrested after police examined the truck and discovered the repair work. 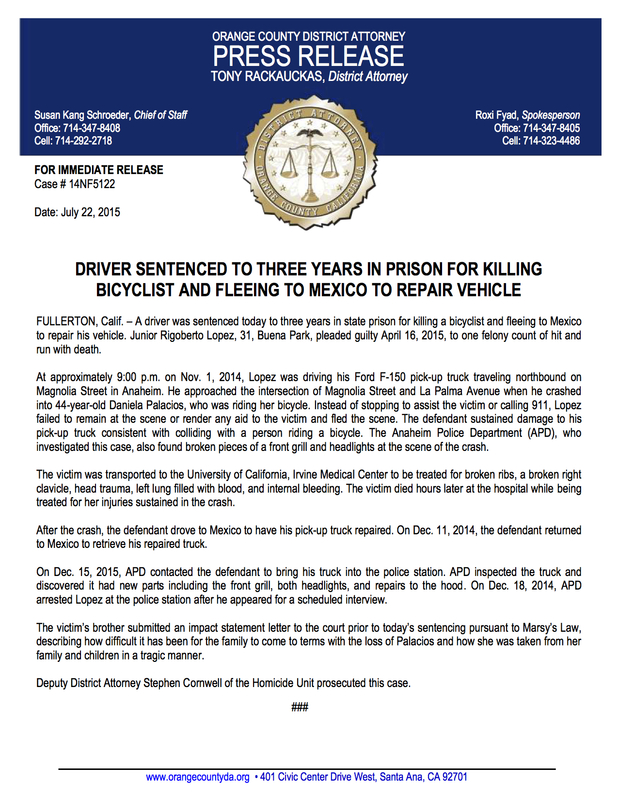 Lopez was sentenced to three years. With credit for time served, he should be out in less than two. Probably far less. In fact, he’s already eligible for parole. What do you mean, nearly? Thanks to Ed Rubinstein and an anonymous source for the heads-up. Both the LA Times and KPCC look at the needless controversy over bike lanes proposed for Westwood Blvd, which have so far been halted by councilmember Paul Koretz at the demand wealthy homeowners. The homeowners cite safety concerns, fearing for the poor riders who could face harm from increased bus traffic, despite having their own lane which would keep them out of the way of buses. Unlike now, when riders are forced to share the same congested lanes with them. Why is it that people who oppose improving safety for bike riders always seem to stress how concerned they are about the safety of bicyclists, while doing absolutely nothing about it? And seriously, don’t read the comments to either of those pieces unless you want to lose all hope for the future of humanity. Speaking of needless battles, the fight over re-opening long-closed Mt. Hollywood Drive to motor vehicles at the resumes tonight at the meeting of the Griffith Park Advisory Board. Homeowners in the wealthy Beachwood Canyon neighborhood, who evidently didn’t notice the Hollywood Sign when they moved in, are trying to turn their community into a virtual private enclave to keep tourists from besmirching their streets in an attempt to get selfies in front of the sign. And they want the park to open the popular biking and hiking street to cars so those tourists can have a much less attractive view of the sign, at the expense of everyone else who uses the park. Yet another failure of rationality in the Biking Black Hole of Beverly Hills, as Better Bike’s Mark Elliot reports the city council voted not to include bike lanes on the soon-to-be-revamped Santa Monica Blvd. This despite the fact that space for bike lanes will be available on almost the entire length of the boulevard, and require the loss of just a few feet of parkland in just one short section. And despite the fact that state law now calls for Complete Streets that meet the needs of all users, not just motor vehicles or over-privileged residents. I’m old enough to remember a time when some towns still had signs warning minorities not to let the sun set on them inside the city limits. That’s the same feeling I get from Beverly Hills. They send a clear message that bikes, and their riders, are not welcome there, and they will do whatever it takes to run us out of town. Although some of their elected leaders get it. Just not enough to make a difference. Not surprising, Elliot also reports the city fails to address the safety of bicyclists in construction projects on the boulevard. Albertor Contador insists the Tour de France is not over, despite Chris Froome’s overwhelming dominance. One rider who won’t be challenging Froome is Teejay van Garderen, who was forced to abandon the race due to illness after struggling in Wednesday’s stage; he says he just wants to disappear after dropping out while still in third place. Despite doping controversies, viewership of the Tour de France is up except in France; America’s only remaining TdF champ gets a warm embrace after returning to the race as a broadcaster. The owner of the Tinkoff-Saxo team calls for a revolution in pro cycling. Good news for Ivan Basso, whose successful surgery for testicular cancer means no further treatment is necessary. And a Singapore cyclist competing in the South East Asian Games is under investigation for repeatedly slapping a teammate on a training ride. Streetsblog looks at multiple motions regarding bikeshare at today’s Metro meeting; Santa Monica’s system is scheduled for a limited opening in August, while Long Beach should open next year. The East Side Riders fulfill a longtime dream by opening a bike co-op in Watts. The LAPD is on the lookout for a pair of Brentwood bike thieves caught on camera stealing a bike from inside a building. Bike LA’s battle with Hollywood over green bike lanes goes on… and on… as LA’s newly installed chief film liaison is working to find a compromise shade of green that will allow the city to finally put some paint on the streets; the city caved to filmmakers demands and stripped the paint off LA’s first green lane on Spring Street in DTLA. Apparently having nothing better to do, the state legislature passes a bill requiring bike riders to pull over on narrow roads when five or more vehicles are following behind and unable to pass. Even though current law, which already applies to cyclists, already says exactly that. BikeSD reports on a new study that concludes the cost of driving a car is six times the cost of riding a bike. The next time someone says police never ticket bike riders, show them this: San Bernardino police ticketed 12 bicyclists and 31 pedestrians as part of a safety sting; not surprisingly, motorists still lead the way with 57 violations. 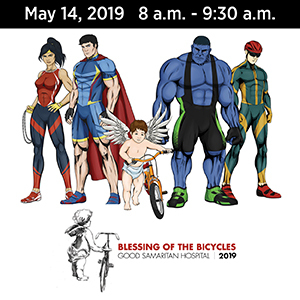 The weeklong Big Bear Cycling Festival kicks off this Saturday. Sixty kids in Mecca — no, not the one in Saudi Arabia — get refurbished bikes, locks and helmets courtesy of a local transit agency. A pair of East Palo Alto brothers, one on a bike and the other on a skateboard, help subdue a man accused of attacking an 89-year old priest. San Francisco settles with a father who was choked by police for riding a bike with his 10-month old son in a baby carrier, but without a baby helmet. No, really. Alameda cyclists will ride Sunday to remember a popular bike shop owner who lost his battle with cancer earlier this month. The idiotic Orinda bike lane that places riders in the path of high speed traffic entering a freeway on double onramps is due for a safety makeover; the city’s chief engineer admits the current design is “not ideal.” A little green paint is not going to solve the problem, or encourage riders to risk their lives there. 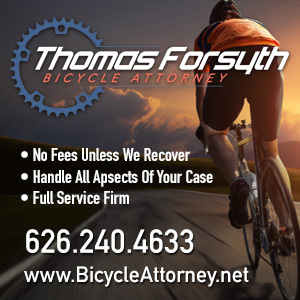 The death of a bike rider in St. Helena last May is blamed on alcohol, even though the victim’s rental fixie had a substandard brake; the Ohio woman, who was celebrating her first anniversary, had a BAC of .18 when she rode into the side of a slow moving truck. Outside Magazine sums up the HBO Real Sports look at the state of bicycling in the US, for those without premium cable. AT&T offers their latest public service ad showing the devastating consequences of texting while driving. Portland advocates say an increase in reported bike thefts means more people are trying to get them back instead of just giving up. An Arizona driver gets nine years for killing a cyclist while high on synthetic marijuana; the victim’s friends complain the sentence wasn’t stiff enough. California cyclists are just happy to see DUI drivers get any jail time. Colorado cyclists call a bizarrely designed bike lane a death trap. This is what happens when people who apparently don’t ride bikes design bicycling infrastructure. Note to business owners fighting bike lanes — you’re shooting yourself in the foot. When Denver installed bike lanes on a pair of streets downtown, retail sales skyrocketed. The Slow Roll movement spreads to Minneapolis, encouraging leisurely rides through neighborhoods where bicycling is less popular. Which is their overly polite way of saying lower-income and minority areas. Vermont police somehow conclude a bike rider made an abrupt U-turn just to collide head-on with the wife of a cop, who was found not at fault even though she was driving drunk while high on Xanax. A 560-pound man is riding across the country to lose weight; he’ll be getting a new donated bike after he was stranded in Rhode Island when his broke. A bike rider is a hero after grabbing a woman’s ankle to keep her from jumping off New York’s George Washington Bridge. But bikes are the problem, right? A seven-month pregnant woman was stabbed in the shoulder while riding her bike home from work in DC. An Atlanta man wasn’t even safe from a hit-and-run driver while walking his bike on the damn sidewalk. The family of a fallen Saskatchewan bike rider call her death senseless after her bike was clipped by a passing delivery truck. Actually, all traffic deaths are senseless; it’s long past time we stopped tolerating them. Instead of fixing a dangerous railroad crossing, British authorities urge cyclists to be careful when riding near it. More Brit women are taking up bicycling despite safety fears. Evidently, it’s okay to kill a cyclist there due to a momentary lapse in concentration. Irish police are accused of misleading cyclists into thinking riders without helmets and hi-viz are subject to on-the-spot fines. A Turkish adventurer has ridden through 19 countries on his bike, as well as a failed attempt to ride to the North Pole; however, authorities wouldn’t let him pedal up Mt. Everest. A Michigan SUV driver somehow couldn’t avoid hitting a cyclist, or an elementary school. Drivers parking in a bike lane is one thing; placing a permanent bus stop in one is another. And if you’re going to threaten to permanently injure the person who stole your bike, it helps if you spell it right. 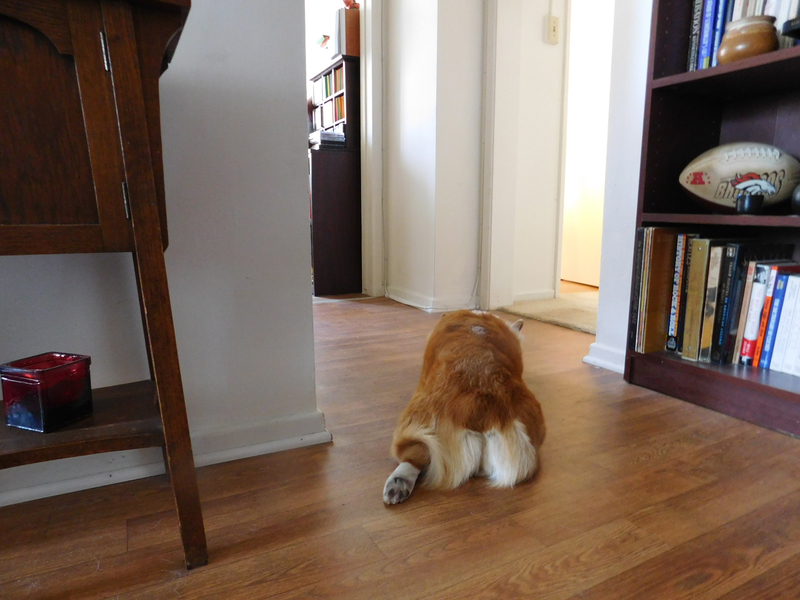 Thanks to everyone who expressed concern about the Corgi. Three days, two vet visits and several hundred dollars later, we learned that she has Giardia, most likely as a result of all the irresponsible dog owners who don’t clean up after their pets around here. The good news is, she should be back to her feisty self in a week or so. An arrest is finally made in the hit-and-run death of an Anaheim mother early last month. Daniella Palacios was riding her bike across the street just blocks from her home when she was run down by a white pickup, whose driver fled the scene without stopping. Now 30-year old Buena Park resident Junior Lopez has been arrested for the crime. He’s being held on $50,000 bond, and his Ford F-150 truck has been seized as evidence. If you find yourself in San Diego tonight, make your way to the Selle Anatomica Christmas Party at 7939 Silverton Ave, Suite 806, from 6 to 9 pm. Just bring a canned good for the San Diego Food Bank and a “funky” item for the schwag exchange. RSVP in advance to [email protected]. 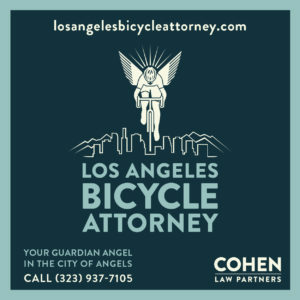 Irvine and Riverside personal injury legal firm Avrek Law introduces the BikeSafe Bicycle Accident Reporting App, allowing you to report bike-related incidents throughout the SoCal region, or search for collision data by year or type. And yes, it does make an impact to see all those wreck sites on a single map. Although I wish lawyers, of all people, would learn to call them collisions instead of accidents, since accident implies that no one is at fault. 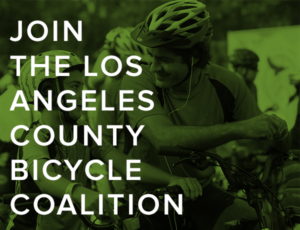 The LACBC is teaming with Better Bike to host a meeting on Monday on how to create a more bike friendly Beverly Hills. Personally, I’d start with a major attitude adjustment at City Hall. Lois forwards this photo of a gray-haired Burbank man who appears to be riding a ghost bike, right down to the RIP sign attached to the frame. Stolen or not, I’d say that’s tempting fate just a little too much. Longtime LA Times columnist Patt Morrison says local bike riders should be required to get an “info license” to make them learn the rules of the road. 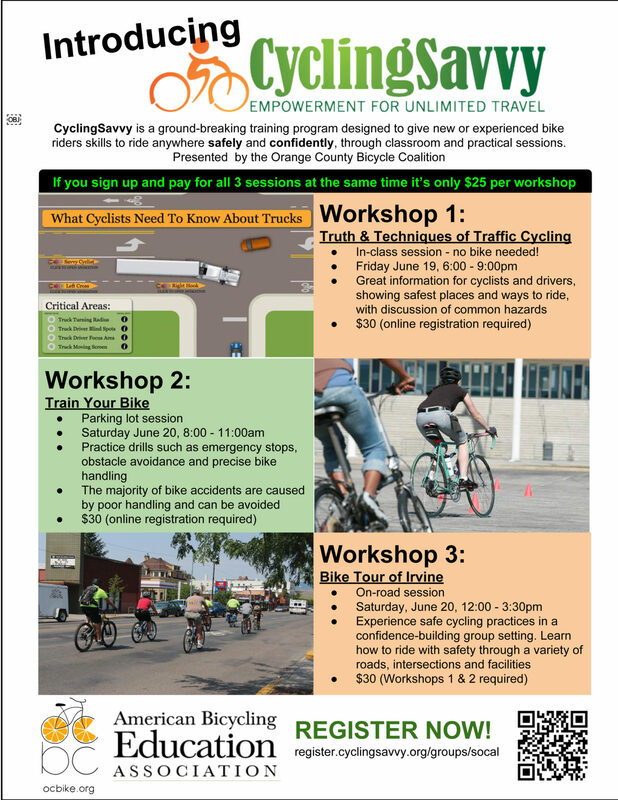 Aside from the fact that only the state can impose licensing requirements — cities can license bikes, but not riders — it’s an interesting, if muddled, unnecessary and ultimately unworkable idea. The USC Bike Coalition unveils first bike repair station and pump on the traditionally bike-unfriendly campus. UPS makes Burbank deliveries by bike. Now that the San Gabriel Valley bike plan has been approved by all five cities involved, Monterey Park cyclists could see improvements as early as next spring. Three Baldwin Park bike thieves are under arrest after the owner spots his stolen bike for sale on Craigslist. An Irvine woman gets just a year in jail for intentionally running down an airport bike cop. San Diego neighborhoods battle over plans to close an off-ramp to make room for a bike and pedestrian corridor, as local merchants fail to grasp that people on bikes spend money, too. Paso Robles plans a L’Eroica Vintage Bicycle Event next April; participants are limited to riders on steel frame bikes built before 1987. An Oklahoma man stops in Petaluma after riding 7,500 miles with his dog in support of animal shelters. That’s a good problem to have, as a Bay Area Caltrain station struggles to keep up with demand for bike parking. The civil trial begins in the case of a San Francisco bike rider killed in a collision with a 13 ton delivery truck. Police initially blamed the cyclist until the SF Bike Coalition found security camera footage that police hadn’t bothered to look for. ‘Tis the season, as a Turlock real estate agency donates 23 bikes for less fortunate children. Requiring sideguards on large trucks could save the lives of countless cyclists and pedestrians. People for Bikes looks at the nation’s 10 best protected bike lanes, including one right here in Temple City. Biking pop star Katy Perry gets a custom painted ride. DC bike riders are most likely to be white or Hispanic, and either wealthy or low income. The ugly Christmas sweater fad spreads to bike jerseys. Although hideous might be a better word. A heartbraking story from the UK, as a father is accused of killing his own bike riding son by passing too closely. Unbelievable. An injured British cyclist is kept waiting over two hours before an ambulance finally arrived. Good thing the peloton has been cleaned up. An Italian pro cyclist is caught using testosterone, despite serving an 18-month ban for doping. Meanwhile, banned cyclist Riccardo Riccò says it’s impossible to win a grand tour without doping; scary thing is, he may be right. A Japanese cyclist is banned from riding his bike for 90 days after crashing while under the influence of quasi-legal drugs. Once again, a driver mistakenly assumes that gas taxes pay for the roads, let alone the bikeways on them, and blames scofflaw cyclists for breaking the law — unlike all those law abiding motorists. Bike riders are often turned away from drive-through widows; evidently, it helps if you use a gun and ask for the contents of the cash drawer. And caught on video: Welsh cyclist Geraint Thomas plays Jingle Bells using bike bells. Yet another innocent person has been murdered by a heartless coward in a motor vehicle. Just one day after three teenage girls were killed by a hit-and-run driver in Santa Ana, a mother of eight has been killed by a driver who fled the scene in nearby Anaheim. Forty-four-year old Anaheim resident Daniella Palacios was apparently riding her bike across Magnolia Avenue just south of La Palma Ave around 9:10 pm Saturday, when she was struck by a vehicle whose driver ran away rather than stop and aid the victim or take responsibility for his actions. Palacios was found lying in the street by one of her nieces, just a few blocks from her home. She was taken to UCI Medical Center in Orange, where she died at 12:46 am. According to the Orange County Register, witnesses reported seeing a white pickup in the area at the time of the collision. Police are looking for the driver, who reportedly fled north on Magnolia, although the truck does not yet appear to have been tied directly to the crash. A street view shows a six lane street, with the wide lanes typical of Orange County that can encourage speeding, especially at off hours such as a Saturday night. In addition, there don’t appear to be any crosswalks or traffic signals until Crescent, several blocks south of La Palma. According to KABC-7, Palacios often brought food to homeless people living in the area, after once being homeless herself. Anyone with information is urged to call Anaheim Police Department at 714/765-1991. As I have said before, the driver of this or any other fatal hit-and-run should face a murder charge, on the assumption that the victim might have survived if she’d gotten help on time. And they should be banned from driving for the rest of their lives. This is the 75th bicycling fatality in Southern California this year, and the 16th in Orange County, which compares to 12 for all of last year. My deepest sympathy and prayers for Daniella Palacios and all her family.